Those of you keeping an eye on the "Loudness Wars" may be interested by current discussions on the Metallica forums. Fans have been complaining bitterly about the extreme clipping distortion on the new album "Death Magnetic" - it's clearly audible on the previews in iTunes, for example - and the finger has been pointed at Ted Jensen, head engineer at Sterling Sound, who mastered the album. Additionally, as my colleague Simon Murphy notes, there are several different types of distortion in the released version, some of which (for example of the snare only) can only have been incurred during tracking or mixing, but others which may have been introduced in mastering. I just skipped through 3 random songs and the highest I saw on the meter was -4,3 dB RMS (-1,3 RMS in AES17 norm), looking at the realtime RMS meter with Wavelab's default time constants. Wavelab's global analysis (with its default time constants) reports -2,93 RMS [+0,07 in AES17] RMS in one of those tracks. Most of the album (looking at the meters) sits between -7 and -5 (between -4 and -2 in AES17). Strange as it may sound, this suggestion actually has some credibility - in order to have versions of new releases available at the same time as the album release, Guitar Hero developers have very early access to the music, and additionally have a certain degree of control over the individual tracks to ensure it works in a game environment. Fans are now discussing "ripping" the versions contained in the PS3 version, and creating their own, less distorted version of the album. Whatever the truth of the matter, from Ted's public statement it's clear he was persuaded to push the album louder than he wished, probably by the band, and against his better judgement. Sadly this is quite common in modern mastering, where the myth that "we need to be louder than everybody else" persists far beyond it's sell-by date. As someone on the Gearslutz Mastering Forum commented recently, most people don't care about the RMS loudness, they just turn it up - have you ever heard anyone complain that Nirvana's "Nevermind" was too quiet, for example ? There have been plenty of clipped, distorted albums before, sadly - Oasis' "What's The Story Morning Glory" was one of the first, for example. What's interesting and unusual about this case is the furious reaction from the fans, and the media coverage that will almost certainly follow. Will this backlash help turn the tide in the Loudness Wars ? We can only hope. I think we need to get a final position from the bandd. It was intentional or not? "St. Anger" was slammed too. The copy I bought came with a bonus DVD containing the same tracks as the album, recorded in their rehearsal rooms. Although the DVD sound is raw "rehearsal room" acoustic, it is clean and rocks in a way that the album doesn't. We put the CD away and only listen to the DVD. Well said Ian, this trend towards garbage sounds is tasteless and short-sighted. Who's the target audience for clip distorion? Psychopaths? Masochists? If an artist wants to trash up their sound, there are plenty of ways to do that before mixdown. Keep fighting the good fight, man. With high-compression formats overtaking sales, it's goood to hear someone speaking out about this nonsense. I think something similar happened to RUSH's Vapor Trails album. If I'm not mistaken. This was the first time the band wasnt there for the mixing as they were on tour in Europe. Artistic integrity is one thing... but I can't imagine that the band is happy with the sound at the end of 'the day that never comes'.. it's god awful.. I noticed that it is not distorted on the video for the song that is out.. I can't believe we're even talking about these numbers, let alone measuring them on CDs. If the single release is cleaner, it probably just reflects the different tools used to get this insane level on there in the first place - or perhaps an earlier, less brutalised mix. I see that most people agree that this CD is horribly mangled by distortion. I bought it on day one of release and I could not believe a major label released it as a final product. I also see a few people saying how great it sounds and the complainers are not listening to the music. Well I propose that it should be released minus the horrible clipping and it will satisfy those who can not hear the dreadful quality and those that need a little headroom for music to sound musical. Win win situation I think. Sounds good to me ! Have you signed the petition ? I bought the album in Serbia and must say that the sound is great. I listern to it everyday in my car which has great sound equipment and DEATH MAGNETIC rocks in there. I think a cleaner, less crushed version would sound even better ! I've been playing GH3 remastered version all this time... the cd version is so much crapier. The cd version sound is not clear. On top of that I use a EQ that is similar to club but with lower 10 and 180 Hz and higher 3kHz. Sounds awesome on my 5.1. 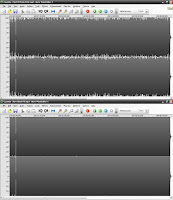 So, remastering the death magnetic proved so much better. MY QUESTION IS: how would St Anger sound remastered?:D:D:D.. I would love a version of that album re-mixed! Email me at candyman82@gmail.com if you have one! Personally, I think the the band (and possibly the producer) were trying to achieve something similar to the sound of St. Anger, which, while many people hated it, I thought was a brilliant piece of engineering by Bob Rock. That album had a very mean, ugly, gritty and chaotic sound that was somehow beautiful. Unfortunately, with Death Magnetic, it sounds like the band and Mr. Rubin left their artistic sensibility behind and just tried to disort entire mixes and even individual elements in the mix, particularly the snare drum. Listen to "Cyanide" for perhaps the most offensive example. You can clearly hear the level of the snare fall dramatically as soon as the vocal kicks in, which tells me that this was extremely intentional and done at the mix level. Again, this harkens back to St. Anger, where Rock stacked multiple drum hits on top of one another to accentuate certain beats. The effect there was interesting and worked pretty well... on Death Magnetic, it is not pleasing to my ear at all. I listened to Death Magnetic in my car and, actually, today was the first time that I popped the cd into my cd player at home and listened to it through my KRK monitors. And I actually thought the cd was scratched, because I heared this strange clipping sound. This could not be! How couldn't I hear this just until now? Well, you cannot hear the bad SQ of the album in your car. The bass drum is all clipped, so that is the sound that you here (broken cd clipped sound). And then I threw out the cd out of my player on the floor, hoping Metallica will do a remaster some day. I really hate the loudness wars. It is like the artists are screaming in your head. After a few minutes you will turn the cd player off because you will get a headache from the sound. I also hear the distortion, which you hear when you scream very loudly into a microphone. The membrane will burst or whatever and you here this: "kgggggggggg" . And that is the same thing with Death Magnetic. Hell, they really messed up. Or, as they turn 50, they are just deaf, Rubin included. People: don't listen to it in your car and then write a positive review. Listen to it at home when it is quiet around you. Put on your headphones or whatever en start listening. Don't be a fanboy. We all want great SQ right? Everyone crticizing the album is a complete idiot who knows nothing about music. It sounds different from their other albums for two reasons. ESP guitars were used on this album and they sound different than Gibsons which James used to record with. I believe James' ESP iron cross guitar has a carved maple top. The maple creates exactly the kind of sound you hear on the album (versus an all mahogany body which is what Gibson Explorers are made of and have a deeper tone). Also, Kirk does the rhythm work for the right channel and Kirk has a different tone than James. (James used to do all the rhythm for both left and right channels). I love this approach because it is truer to their live sound than the old albums. Their amp setups were probably a little different too. I don't think the sound had ANYTHING to do with the mastering process. I love the new sound, personally, and am glad they took a new approach. Oh dear... Using "different" guitars doesn't make the snare distort and the bass drum clip!!!!! Death Magnetic needs a remaster. Sounds like a 14 year old did it.